Here's a question for everybody: do you steal your loved ones' clothes? I get the impression it's pretty universal. I used to pillage my big brother John's closet all the time as a kid. I'd roll up his jeans or drown myself in his big, worn-out sweatshirts. I loved it. A boy's clothes are usually a little worn out and a little too big, which brings that effortlessly chic feel to a casual outfit. But it's more than just that, am I right? I used to love John's clothes because they made me feel reminded of that happy, big-brotherly protective vibe all day (even though in practice, I spent most of my time around my brother driving him crazy). This dynamic is still hard at work today, when I constantly steal, borrow, or otherwise co-opt my boyfriend's clothing with fierce regularity. I know that I'm not alone in this. Women have been wearing their guys' stuff for ages. How else do you explain Meryn Cadell's 'The Sweater'? 1.) MC wore some kickass (now) vintage duds. 2.) The older something gets (like a t-shirt or jeans), the better. 3.) Wearing MC's ancient garments is a cool way to celebrate the fact that I don’t just love him now, I loved him then too. (Even though I did not yet actually know he existed, as I was only 7 years old). That last part is pretty cheeseball but what can I say? I don’t just dig my boyfriend when he’s around me, I totally adore the sum total of him! The cells that make him up; the things he says to people when I’m not around; the melancholy pop he listened to as a teenager. And snuggling up to a thoroughly kickass looking tee that he put on before he ever knew me seems to reach through time and plant a big kiss on the MC from 1988 – even though, I was a 2nd grader living in a town he’d never heard of. He was still mine, even then, he just didn’t know it yet. 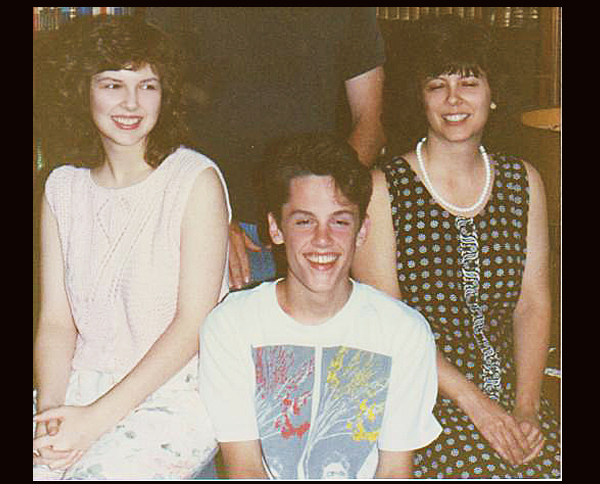 MC rocks the t-shirt in question with his mom and sis in 1988. Of course, this principle is hardly reserved for boyfriends and girlfriends. I have much cherished items once belonging to my mom and dad that carry the exact same lovely, comforting feelings (you can bet I've never forgiven my mom for accidentally throwing away my dad's old mechanic's uniform from the '60s). And you can bet I'll feature those pieces too. So what about you? Do you steal or borrow clothes from your friends, parents, or sweetheart? My gf steals my clothes all the time, but mostly for sleeping. She says my shirts are softer and I usually say she should just get softer shirts. Maybe she has been wearing them for sentimental reasons all along. Yes. Morrissey and Meryn Cadell's "The Sweater." Wow. This combination summarizes my teenage life. I haven't heard that song in years! I never knew there was a visual! And I still steal my husband's clothes - they really have a bit of magic infused in the fibers. When my husband/then-boyfriend and I traveled through Europe I began taking things from his suitcase after I'd grown tired of remixing my own things, and since then his button-up shirts have become my Saturday morning costume. There is nothing like wrapping yourself up in the clothing of your soul-mate to make you feel content. This post made me feel sappy and sentimental- a little talk of Morrissey, a little talk of love... sigh. PS, I love the new header. It suits you (the you that you project into this blog) well.